This is an independent film that deals with the universal problem of a new generation of immigrants having its young people gravitate towards gangs to protect and assert themselves. Director/writer/cinematographer, Christopher Chambers became interested in the Armenian culture in Los Angeles, a subject that he knew very little about when he began this project. This particular group came to the United States from the old Soviet Union and were hardworking, usually poor people. 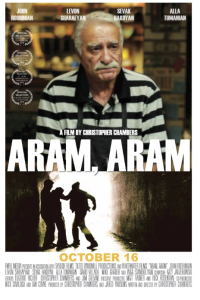 Chambers wanted the story to be very authentic so he decided to cast only Armenians as his lead actors and to have most of the film in their native language (with subtitles), which he did not speak. He was quite clear, however, about the story that he wanted to tell. John Roohinian was chosen in an open audition to play Aram, a 12-year-old boy who came to live in the United States in Los Angeles with his grandfather. Sevak Hakoyan, a young man who was studying acting was chosen to play Hakop, the Armanian gang leader. The casting of Arsen, the young boy’s grandfather who wanted to keep his grandson on the straight and narrow path, involved tracking down Levon Sharafyan, an experienced Armenian actor, who is well known in Armenian films and Armenian television. Much to his surprise, film maker, Christopher Chambers found him living in the Los Angeles area and the rest is history as he magnificently played the all important grandfather with sensitivity and, of course, with authenticity. This is an artistic film with wonderful camera work and editing by Mr. Chambers. Although most of the dialogue, which is translated into subtitles is conveyed by excellent acting and direction, the final portion of the film, which was also filled with action, tension, emotion and sentimentality is essentially without dialogue. The essence of the story is simple but worth telling. This movie deserves to be seen, not only by the usual movie goers but also by students in our city schools where the film will resonate with many of the new generation of young people from immigrant families and should, strike a meaningful chord with them. (2015).